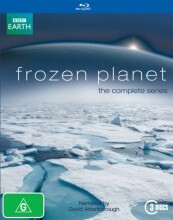 Frozen Planet Blu Ray from DVDLand. A great David Attenborough doco series in stunning Blu Ray at DVDLand. Amazing 8 hours on Blu Ray. This landmark, six-part series from the BBCs world renowned Natural History Unit brings to the screen the frozen wildernesses of the Arctic and Antarctic. Ambitious and epic in scale, it is the ultimate close encounter with the polar regions, capturing all the jaw-dropping beauty and majestic power of the elements. Narrated by acclaimed naturalist Sir David Attenborough and featuring the incredible wildlife cinematography that made Planet Earth such a worldwide success, Frozen Planet has taken new technology to the most extreme and remote parts of our planet, capturing groundbreaking imagery above and below the ice. With the effects of global warming more evident in the Arctic and Antarctic than anywhere else on the planet, this could be the last time they are filmed in such detail, before they change forever. Encounter spectacles that few of us will ever witness as the camera teams go deep under the sea-ice into a magical world of giants, plunge into the heart of an erupting polar volcano and fly to the South Pole across the Antarctic icecap, the largest concentration of ice on our planet, retracing the steps of the great polar explorers. Along the way you will get closer than ever before to the lives of our best loved and most charismatic animal characters polar bears, penguins, wolves and orcas, and witness the most extraordinary examples of survival against the odds as can be found anywhere on our planet. This is the poles as youve never seen them before, and may never see them again As seen on Channel 9. 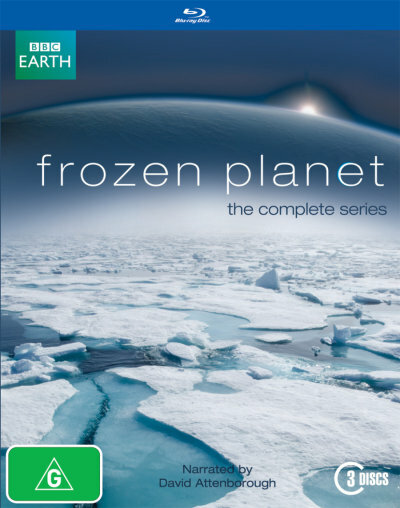 Click the button below to add the FROZEN PLANET - DAVID ATTENBOROUGH (BLU RAY) to your wish list.